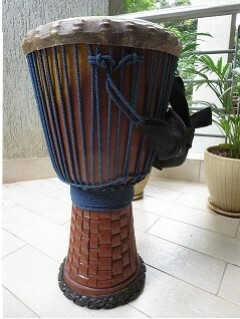 The djembe is a traditional musical instrument from West-Africa, including Guinea, Mali, Senegal, Ivory Coast. They are made in one piece from a hollowed out tree trunk and covered with a shaved goatskin. A rope is attached to the wood and make the tension on the skin. 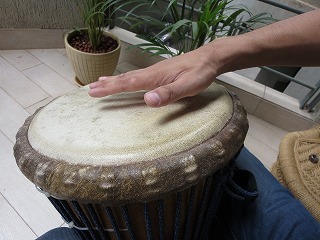 The djembe is played with the hands, and different tonalities are achieved through different hand positions and the manner in which one strikes the skin. 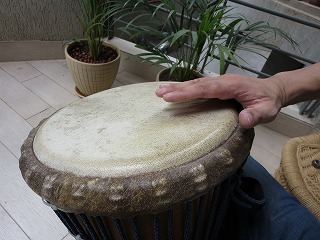 Djembe can produce three different tones. We make rhythms by making full use of these tones. The hands should stay on the skin as shorter as possible. The lowest pitch on the djembe. 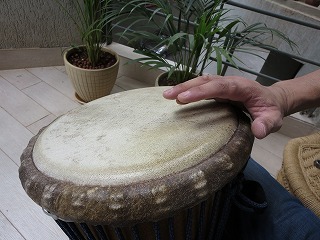 To get this sound one's hand, including palm and fingers, must flatly land on, or near the center of the drum head. This sound is produced by flatly striking all four fingers on the drum. One should close the fingers and the line from the elbow to the finger nails must be straight. Metallic tone; The most high pitched sound on the djembe. It is achieved by striking the drum head with slightly separated fingers. Although the entire length of fingers, not palms, touches the skin, the focus of the blow is concentrated on the fingertips.